Today in 1947, Edwin H. Land demonstrated the first instant camera, the Polaroid Land camera, during a meeting of the Optical Society of America. Land started thinking about an instant camera a few years earlier when his 3-year-old daughter asked him why can’t she see immediately the picture he had taken of her. 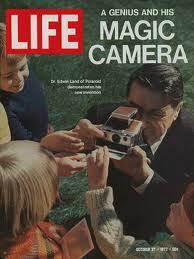 Four million Polaroid cameras were sold from 1948 to 1962. At the end of last year, Polaroid had introduced the Z340 Instant Digital Camera, a 14MP digital camera with an integrated ZINK-enabled printer.